Sean makes me this almost every day, and he cuts mine in half on a diagonal, because that's what makes me smile. He's a keeper! 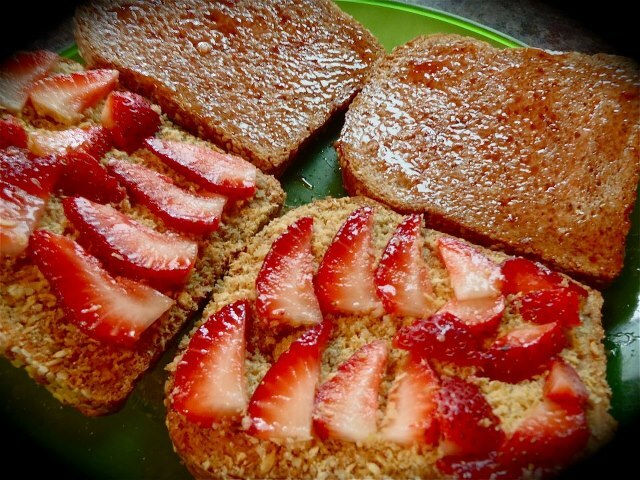 This is the very best PB&J I ever did eat. Enjoy! Men: Approximately 105 pounds for the first 5 feet of height and then 5 pounds for every inch thereafter. Therefore a 5'10" male should weigh approximately 155 pounds. Why am I telling you this? My concerns are not about weight, but about personal health. Turns out, when you are healthy, you are your ideal body weight! Weight is not hereditary. It has nothing to do with your race or ethnicity. It is what you eat. It is so important to me to inform people of the importance of whole foods, plant based nutrition. You don't have to be struggling with weight at all, in order to do yourself the favor of getting enough nutrients every day. The more you commit to it, the more you benefit. You prevent disease and you look and feel your best. Why does this happen? Because this is how we are supposed to eat! We are still animals. Living things. We are not supposed to eat preservatives. We are not supposed to eat microwaved dead food. We are not supposed to drink isolated protein shakes. We are not supposed to drink sugar, aspartame, whatever the hell Red Bull is, or the milk of other mammals. We are not supposed to eat highly refined nutrient void, well, anything! Your food should not make you sick. Or fat. Yet these items are what stock the shelves of every grocery store. That IS what you're eating. Changing your eating habits can be quite a pleasure. You may not think so, because you are probably addicted to food that will eventually make you sick, give you high cholesterol, make you gain excessive weight, give you heart disease, and other health problems. Wait until you see the difference in how you feel after you detoxify your body with whole plant foods! Are you thinking... I can never live without eating _______!? (fill in the blank) Well if that's the case, maybe you should challenge yourself. Read Eat to Live and follow his meal plan as a guide. Or.... just make a real changes on your own. 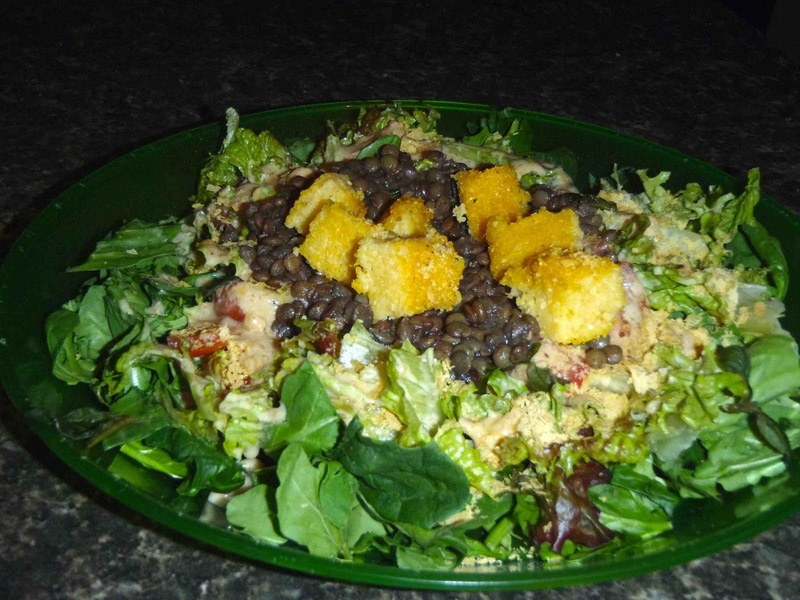 Fill up on plants, beans, whole grains, legumes. Read labels. Take out out EVERYTHING in your pantry/fridge that has ingredients that you can't picture in your mind. Take out EVERYTHING that contains preservatives, additives, refined sugars, aspartame, all that crap. Look at it all. Is it a big pile? If it is, it's time to make a change. Throw it away. Don't buy it anymore. Sound extreme? It's the best thing you'll ever do for the health of yourself and your family. You can still find pleasure in what you eat, once you do away with those addictions you may have to salt, sugar, oils, and refined foods. Once you break that awful habit that almost all Americans struggle with, your tastes will change and you will find that things that make you feel better, taste better. What a great thing! Convenient too! Now your grocery bill drops significantly because you aren't buying all that pre-packaged junk. You are free to indulge in new, exciting, all natural whole foods. What's holding you back? Speaking of indulgence.... Polenta croutons are vegan, gluten free, and oil free. They taste amazing on a salad with lentils and arugula, and are delectable on top of a veggie chili! In a large pan, add all except pepper and half the nutritional yeast. Over medium heat, sauté about 10-15 minutes, until mixture becomes very thick. Remove from heat. Transfer mixture onto parchment paper, spreading it until it's approximately 1/2 inch thick. Deeply score mixture with a knife into 1/2 inch cubes. Sprinkle with remaining nutritional yeast and black pepper. 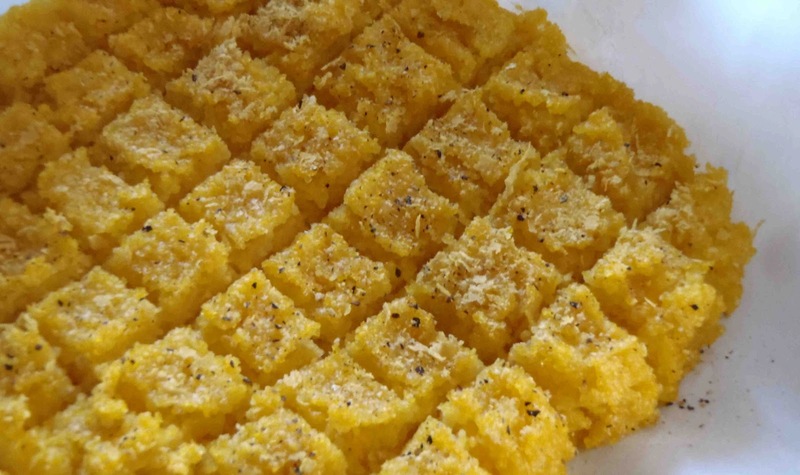 Bake scored polenta at 400º 20-25 minutes. Let cool completely before removing into squares.